Who should play the hacker protagonist Aiden Pearce? There's a few more months left before you can play Watch Dogs as super hacker Aiden Pearce on your TV and PC screens - but Ubisoft has a bigger screen in mind for you to experience the game's story. Officially announced at Gamescom today, Ubisoft is partnering with Sony Pictures Entertainment and New Regency to bring you an "exciting thriller" in the form of a Watch Dogs feature film. A release date wasn't mentioned, but the movie is listed on IMDB with a 2015 date. Only time will tell if this is accurate but it sounds plausible since the film is in the pre-production phase. Does a Watch Dogs film make you more excited to play the open world action-adventure game? And who do you think should be cast as Aiden Pearce? (Not Tom Cruise). 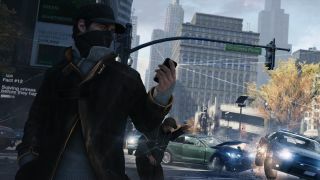 Watch Dogs the game will be available on PlayStation 3, Xbox 360, Wii U and PC in North America on Nov. 19 and in Europe on Nov. 22 - and of course on the next-gen PlayStation 4 and Xbox One. Our blips are the small screen variety with big screen ambitions.